The Open Handset Alliance (OHA) was announced on the same day Android was revealed to the world a bit over 3 years ago, with the sole purpose of promoting the open and free mobile platform. Therefore, I have no reason to believe that Alvaro, who is part of OHA's leadership, usability, and testing team(s) would be deliberately lying about something like this (although anything is possible). 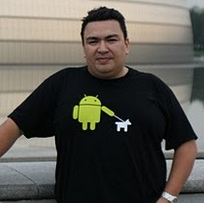 Plus, how can a man sporting such a cool Android t-shirt be telling anything but the truth about the beloved OS? If what he says is indeed true, and the Gingerbread release will be more than just the SDK, I don't imagine it will take long for it to leak out to the masses for all Nexus Ones owners to apply. It does strike me as a bit weird though, as last time the SDK and the Nexus One release were about a month apart. One thing is certain, with the Samsung conference tomorrow and all the Gingerbread rumors, this week promises to be very-very interesting.